The Terriers brought home more than the Kelley-Harkness Trophy from their New York City visit. 2001 birthdate Robert Mastrosimone, a prolific, quick scorer and playmaker from E. Islip, NY, who is now skating for Shattuck St. Mary’s (Boys Bantam), committed to BU Sunday. The left-shot forward, who currently has a 32-32-64 scoring line in 29 games for the SSM Bantams, joins Selects Academy forward Joel Farabee in BU’s 2019 recruit class. 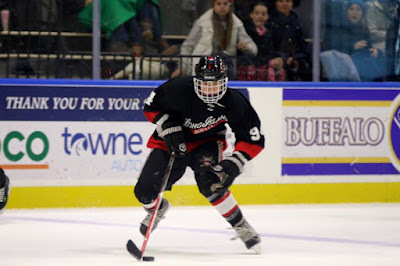 Last season, Matrosimone was a standout playing for the Long Island Royals Bantam Major 2000s and scored the championship-winning goal in a shootout at the Buffalo Super Series . 01 F Robert Mastrosimone (BU) is slippery through traffic, finds ways to impact every game. Quick feet/wrists & gritty: top tier player. 01 F Robert Mastrosimone – Shattuck-St. Mary’s U14—Dynamic, buzzing forward with good acceleration. Skates well, quick hands, reads the goaltender well and not afraid to fire it. Has a quick shot that can punish, could have some more accuracy but was trying to beat well-framed goaltenders to the corners and went just high/wide a few times. His shots are tricky for keepers because he usually has some speed behind the puck and releases darts quickly. His quickness and effort level help him recover pucks and play a two-way game. His burst allowed him to enter the zone with ease here. Like the others who played ‘00s last year, he was a step faster, processed it a few steps faster, and his scoring sense was more refined. Didn’t fade in game 3 energy-wise like most players did, hit the ice like he was fired out of a cannon. Shoots left. ► BU 2018 recruits Jake Wise and Tyler Weiss participated in the 2014 SFX event, which brings together the top 68 U.S. Bantam players. 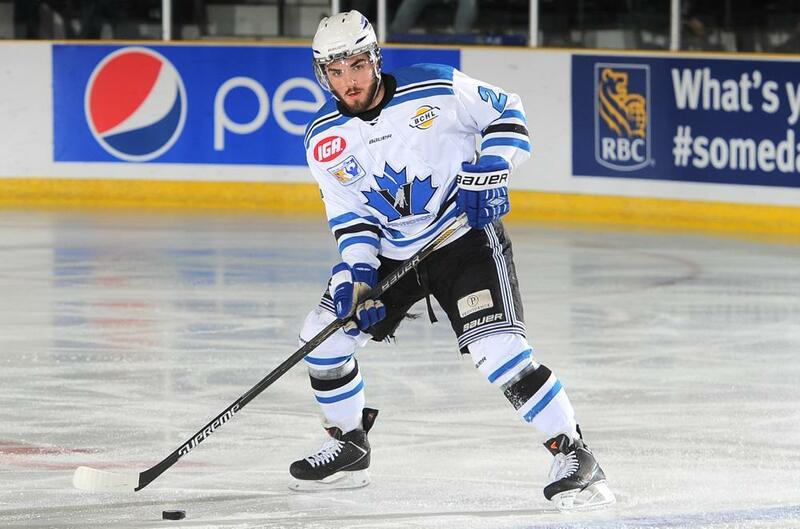 2016 recruit Dante Fabbro assisted on three goals in Penticton’s 8-1 rout of the Trail Smoke Eaters, upping his points total to 37 in 22 games. The right-shot defenseman has recorded points in 19 games for the BCHL’s leading team. At the Silver Sticks Tournament, 2018 recruit Tyler Weiss scored a goal in Don Mills 5-1 win against the London Jr. Knights and then scored the Flyers’ only goal in a 1-1 tie with the Barrie Colts. On the strength of two third-period goals by sophomore Victoria Bach, BU defeated Ohio State in the second round of the Windjammer Classic in Burlington, Vermont. The Terriers opened up a 2-0 lead in the first period, on goals by captain Kayla Tutino and sophomore Rebecca Leslie. The teams traded goals in the second period, with Sarah Lefort scoring for BU, and Bach’s first goal two minutes into the final period stretched the lead to 4-1. The Buckeyes responded with two scores in 92 second to cut the margin to one, before Bach provided some breathing room—and the game’s final goal—on a power play. Bach, who also recorded two assists, was the game’s first star, while sophomore Erin O’Neil turned aside 26 shots to earn the win. #11/12 Terriers came from behind twice in the third period with goals from freshmen Bobo Carpenter and Jordan Greenway and sophomore AJ Greer to tie Cornell, 3-3, in the fifth edition of Red Hot Hockey before a vocal crowd of 17,154 at New York's Madison Square Garden. 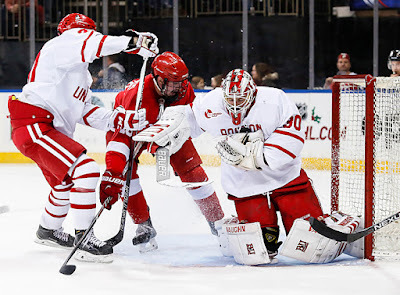 After a five-minute overtime produced no victor, a shootout was played to determine which team would take home the Kelley-Harkness Trophy and seniors Danny O'Regan, Ahti Oksanen and Matt Lane all converted their chances to give BU a 3-2 shootout win. Cornell, which outweighed BU by nearly 10 pounds per player, got its cycling game going early and controlled play during the opening minutes. BU rebounded to have a 10-9 shot advantage for the period and nearly scored on a shot that hit iron. Cornell took the lead early in the second. After BU effectively killed most of a penalty to John MacLeod, Anthony Angello deflected a shot from center point past Connor LaCouvee. Five minutes later, the Big Red doubled the lead after LaCouvee failed to cover a loose puck and two quick passes allowed Trevor Yates to slide the puck home. BU had a golden opportunity in the final minutes of the period but O’Regan was robbed on a 2-on-1 by Cornell’s Mitch Gillam. Terriers put their foot on the gas in the third and were rewarded at 5:36 when Carpenter snapped a wrist shot past Gillam following passes from Greer and Nikolas Olsson. Three minutes later, Greer fired from the left circle and beat Gillam high to the stick side after passes from Olsson and Charlie McAvoy. Cornell regained the lead midway through the period on Holden Anderson’s deflection; but at 16:05, a gritty goal knotted the score again. Lane put a sharp-angle shot on net and Greenway jammed the loose puck home. ►Greer was named the game’s first star and Greenway received the third star. ►LaCouvee stopped 22 of 25 Big Red shots while his counterpart made 40 saves. 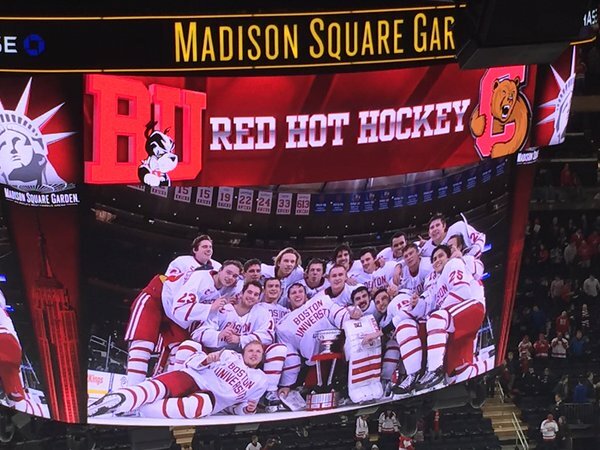 BU outshot Cornell 16-6 in the third period and 6-0 in the overtime. ►Complete game replays are available from TerrierTV and the Ivy League Digital Network. Terriers dropped a 4-2 decision to an opportunistic Cornell team in the opening round of the Windjammer Classic in Burlington, Vermont. BU held a 2-1 lead during the first period after seniors Sarah Lefort and Lillian Ribeirinha-Braga connected for a pair of goals within a minute. Lefort’s tally came on a power play. The Big Red knotted the score late in the first and added two second-period goals, with the second coming just 16 seconds from the end of the period. BU pressured Cornell throughout the final period, with a 10-5 shots advantage, but was unable to find the net. Terriers play Ohio State today with puck drop set for 1 p.m. The game will be available on CatamouTV.